One of Canada’s tallest and most iconic waterfront condominium communities is coming soon to the Toronto Etobicoke waterfront real estate district. The new Humber Bay Shores Etobicoke Eau Du Soleil Toronto condo project features awe inspiring design, phenomenal uninterrupted views and panoramas, spectacular on site resort style amenity spaces and an unparalleled destination of next generation Humber Bay Shores Etobicoke waterfront living. The new Etobicoke Eau Du Soleil Toronto condo tower will feature affordable waterfront condo living starting from the low $200’s. Located at the crossroads of Lake Shore Boulevard West and Marine Parade Drive Etobicoke Eau Du Soleil Toronto condo tower will be built by award winning Empire Communities. This master planned Etobicoke waterfront real estate development will be starting sales in early 2012 and will be designed by MJMA Architects. The initial design of the preconstruction Toronto Eau Du Soleil Etobicoke waterfront real estate development is for 2 towers (of different heights) joined by an elegant and tall podium along the water. 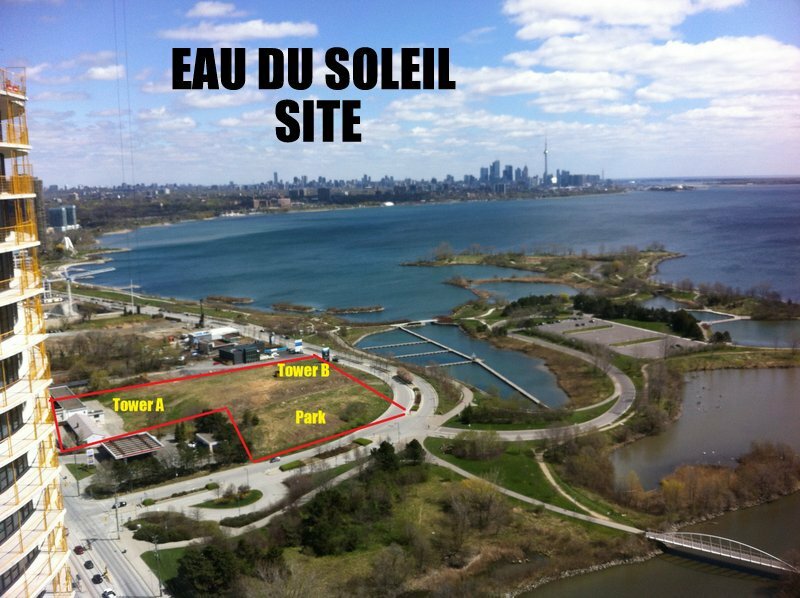 The actual Humber Bay Shores project site for the new Toronto Eau Du Soleil Etobicoke landmark tower will be at 2183 Lakeshore Boulevard West Toronto and will be Canada’s tallest waterfront high-rise to be built ever. 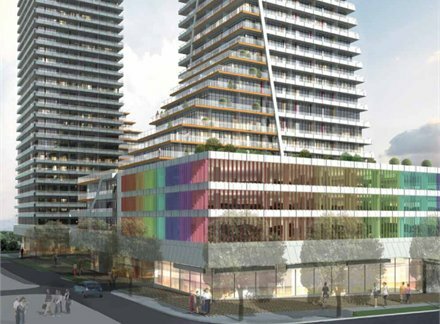 The taller high-rise at the new Eau Du Soleil Etobicoke Toronto condo project by Empire Communities will be between 60 to 65 storeys in height. The lower of the 2 high-rises will be approximately 40 to 45 storeys. The ‘Eau Du Soleil’ Etobicoke condo tower name is derived from a term that means ‘Water of the Sun’. Empire Communities is also the builder for notable successful projects recently such as Humber Bay Park’s Beyond the Sea landmark high-rise as well as O2, The Modern and Fly Condominiums. In addition to the Humber Bay Shores Eau Du Soleil Etobicoke condos in Toronto, Empire Communities will also be completing the new Oakville Rain Condominium project. What’s really exciting about Canada’s Tallest Waterfront Tower at the preconstruction Etobicoke Eau Du Soleil Toronto Humber Bay Shores condo project is that there are only a handful of taller structures in the city that include only the Toronto Shangri La at sixty five floors, the ICE Condos Phase 2 tower at the same number, One Bloor Avenue at seventy storeys and the tallest, which is the AURA Toronto condo tower at seventy five storeys. The tallest Eau Du Soleil Etobicoke condo tower in the Humber Bay Shores district is expected to be up to 65 floors! 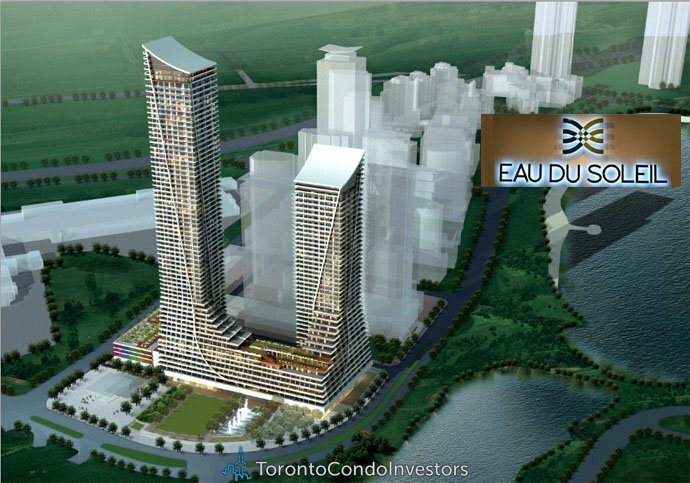 In April 2012, the developer released some more information about the preconstruction Etobicoke waterfront condominiums at the EAU DU SOLEIL towers. The first high-rise to be released is Tower ‘A’ or the Eau du Soleil Sky Tower along the Etobicoke waterfront district. Here, you will find many amenities that will include an arrival porte cochere, gracious lobby entrance with double sided fireplace and seating area as well as a twenty four hour concierge/security desk. In addition, the preconstruction Etobicoke EAU DU SOLEIL Sky Tower A will feature multiple guest suites for visiting friends and family in addition to a superintendent suite for on site supervision and management. The Sky Tower at EAU DU SOLEIL Etobicoke waterfront condominiums will also have a pet wash area and a dedicated car wash area. The amenity areas will also be Wi-Fi ready for internet on your technology. The Eau Du Soleil Sky Tower Entertainment Area along the Etobicoke waterfront real estate district will feature a party room that is complete with a full kitchen, lounge space with comfortable seating and a wet bar. There is also a large outdoor bar area and an outdoor landscaped Terrace deck complete with seating areas, cabanas for relaxing, a fire pit and BBQs for summer parties. The preconstruction Etobicoke EAU DU SOLEIL Sky Tower condo high rise will also have multiple theatre rooms, meeting room, a billiards/games room and private dining rooms complete with full kitchens too. The Sky Tower at EAU DU SOLEIL Etibicoke waterfront condos will also have personally encoded security systems with deypad and door contacts and all homes will have both heat and smoke as well as carbon monoxide detectors. The main garage doors and amenity spaces will have key fob access and the elevetors are restricted to your level and the amenity floors. The preconstruction Etobicoke EAU DU SOLEIL waterfront condominiums at Sky Tower A will also have underground parking for its residents. The Sky Tower at Eau Du Soleil Etobicoke waterfront condos for sale will have private outdoor spaces as per floor plan in addition to 9 foot ceiling heights on all floors and 10 foot ceilings on floors 60 and higher. There are secure, solid core entry doors, mirrored sliding doors on foyer entrance and plank laminate engineered flooring in the living room, dining room, kitchen, bedrooms, den, foyer, and hallways again as per floor plan. The waterfront Etobicoke Eau Du Soleil Sky Tower A suites will also have glazed porcelain or ceramic tiled floors in the baths and white ceramic floor tiling in the laundry closets. There are front loading washer and dryer that are stacked as well as walls painted in white latex paint. All homes have heating and air conditioning. The waterfront Etobicoke Eau Du Soleil Sky Tower A suites will also have kitchens that include stainless steel appliances, contemporary custom designed cabinetry, polished granite, glass tiled backsplashes and sink with single lever faucet. The bathrooms at the preconstruction Eau du Soleil Etobicoke Sky Tower A condos will include a one piece custom designed cultured marble integrated sink with single lever faucet, designer vanity mirror including a light fixtures, soaker tub as per floor plan and exhaust fans vented to the outside. The bathrooms at the boutique Eau du Soleil Sky Tower Etobicoke waterfront condominiums will also include a choice of ceramic or glazed porcelain tiled floors, tub and shower surrounds in addition to rain shower heads.